Derbyshire County Council has faced a barrage from concerned teachers and students regarding the ongoing impact of funding cuts to their schools. During a full council meeting in Matlock on Wednesday, teachers revealed that their funding was falling by hundreds of pounds per pupil and they cannot properly cater for children with special educational needs. Another said that that they could no longer offer music as a class and a student revealed her school – now an academy – could not afford to give lined paper to its pupils. Headteacher at Chesterfield’s Brampton Primary School, Wayne Parkinson, kicked off the debate. He said that his school has 13 pupils who require Education, Health and Care Plans – a legal document which lays out the specific support that these children require. Mr Parkinson says that the school only has funding for four pupils. He asked how many schools have five or more pupils on EHC Plans. Councillor Alex Dale, the cabinet member for young people, said that 32 schools had five or more pupils on EHC plans – excluding special schools – accounting for 9.1 per cent of those under the council’s control. He said that he would continue to lobby government funding more funding for pupils with special educational needs. “It is a key area of concern for us,” he said. However, he said ‘we are managing relatively better than some of our neighbours’. Deborah Turner, from the National Union of Teachers, said the current funding crisis was putting vulnerable and disadvantaged pupils - as well as those with special educational needs - at risk. Coun Dale said the authority ‘has a robust policy of risk analysis and providing support for these children’. He said that there is a “whole school approach to mental health, but there is always more we can do, I fully accept that”. 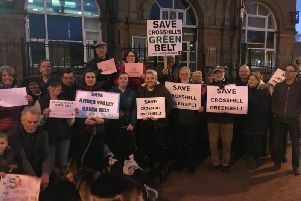 The councillor added: “We will continue to lobby government. We don’t think the new school funding formula goes far enough. Derbyshire has 50 per cent less funding than some others. Students from Chestefield’s Brookfield Secondary School, Katie Hibbert, Lily Beard and Katie Bargh, also had a question for councillors. Ms Bargh spoke at the meeting. She said: “The cuts and changes to school funding have resulted in many schools converting to academies, including ours. “Since the change, Brookfield has gone from being an outstanding school under local authority control to one that is classed as inadequate and will be sold off to a multi academy trust. “As pupils, we have seen the impact that these cuts have had. She suggested that the quality of education provided should be a greater priority than the ideological pressure to convert a school into an academy. In response, Coun Dale said: “The quality of education is paramount. Any decision is made in the best interest of each school. He said that he could not comment on the academy’s spending, it was down to them to decide how to do this. However, he said that it is set to receive £100 more per pupil per year – as it would if it was still under local authority control. He said: “Like many schools in the county, performance is fluctuating, it is not necessarily down to its operating model (academy versus local authority control) – there are other variables. Coun Dale said that he would continue lobbying government and local MPs for funding as part of the F40 – a group of the lowest-funded education authorities in England. Lisa Tunnell, from the National Education Union, said that school funding cuts were having a strong impact.